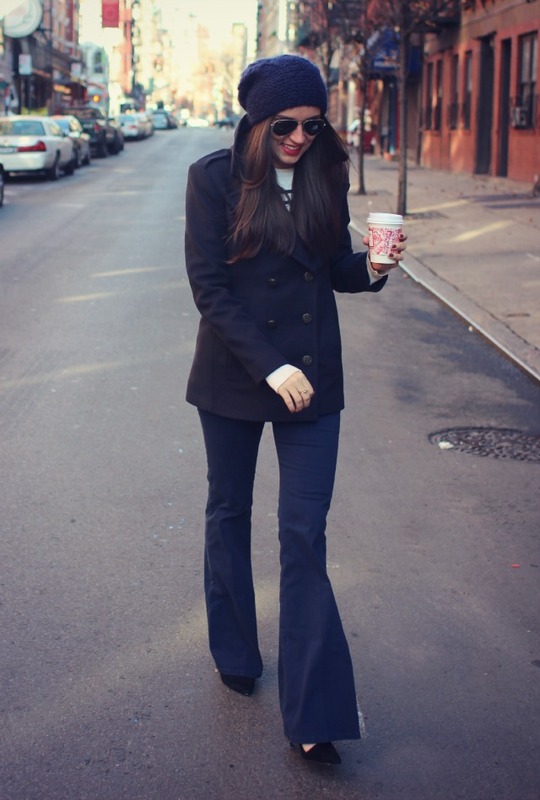 T. Babeton pea coat / H & M sweater (old) / MiH 'Marrakesh' flares (on loan) / Aldo pumps / Ray-Ban aviators / Hat Attack hat (c/o). French navy my sailor mate"
I couldn't help but think of that amazing Camera Obscura song when I put together this outfit today. I think I mentioned that when I first started talking about my need for a navy pea coat, part of the reason was to look a little like a surly sailor (and Robert Redford). 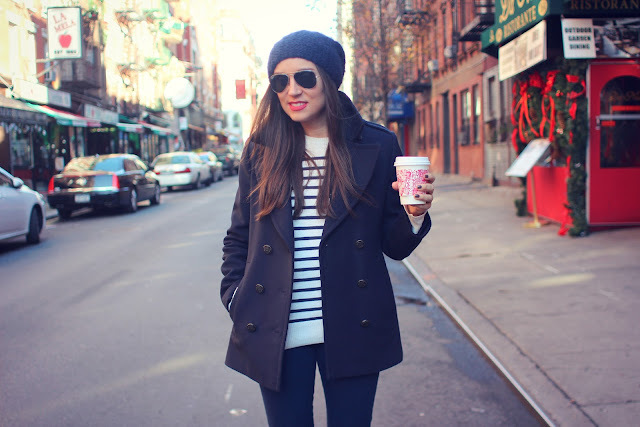 With my nautical stripes I don't feel surly so much as un peu francais, non? Also, can we talk about these MiH flares for a sec? I got the velvet ones last winter, and fell in love with the cut and super-soft fabric. They're easy to dress up for the holidays and with a heel they make your legs look insanely long. These are a new twill version, and while not as soft, they're a bit more crisp, which I like. Such a simple outfit yet you make it look so effortlessly chic! Much love. This whole outfit is awesome. Head to toe! By the way, do you have any suggestions or ideas about things to do in NYC for New Year's? Have you ever done tickets for those huge open bar things, or are there other options if you want to hang out at bars? Trying to think of something fun for this year with friends! I love the simplicity! Navy is one of my favorite colors for winter; it always so chic. No different here! I really like the flares (and the whole outfit). 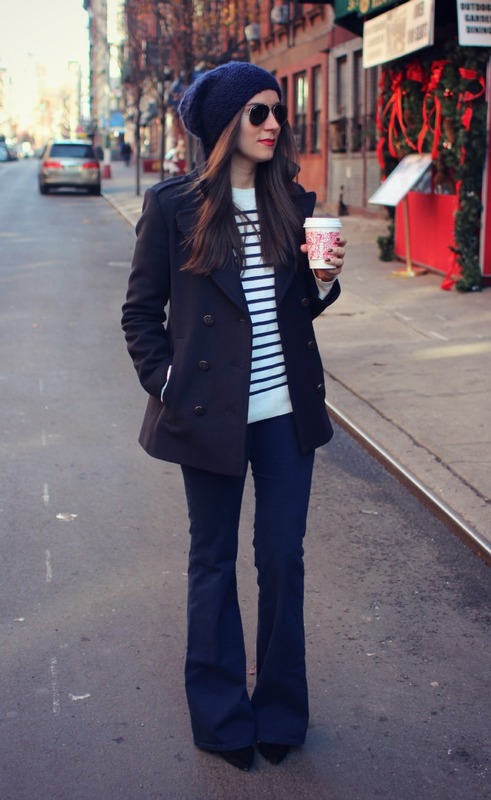 I'm always a little hesitant to try out flare-legged pants, but I like how you styled them here. Might have to give the style another shot. Just discovered your blog-- its great (especially love the name haha). Happy writing! Wow. I love your jeans. I love the color. I used to wear them when I was schooling. This jean design never gets old.